Posted by Matt Shaffer BSN, RN, PHN | May 18, 2015 | Nutrition, What's in my food? Looks can be deceiving when it comes to food marketing and sometimes you would think the healthier options could be healthier for you. 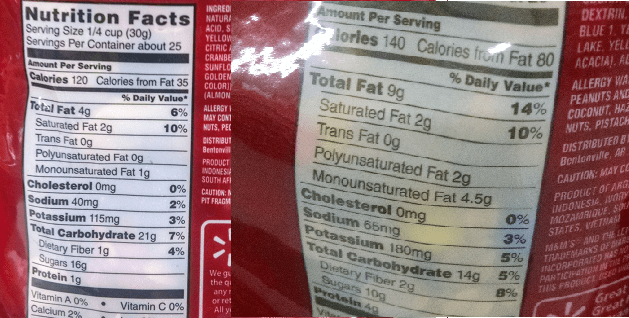 Here’s an example of what you can learn by taking a look at the back of the packaging with two types of trail mix – one with candy and one without. You’d be surprised which one has less sugar. One of the basic nutrition tips has been to always look at the back of the label. Sometimes there can be an ideology that says, “it’s not about the calorie content, it’s about the food content.” While that can sometimes be true, it’s still important to take calorie and macronutrient consumption into consideration. has no chocolate candy like the mountain trail mix and only has dried fruit with an assortment of nuts. If you’re a person trying to watch your overall intake of carbohydrates, you might naturally think the item without the chocolates would be the best pick for you. As you can tel, the trail mix with the chocolates (pictured on the right) has one third less (14g vs. 21g) of carbohydrates compared to the fruit mix trail mix. Depending on what your health goals are, this could have important implications. For example, the trail mix with the chocolates also has a higher fat, protein, and fiber content which will help to make you feel more full as well as slow the spike of blood sugar. While there definitely still is an argument for the content of calories vs the type of calories, it’s still important, and always will be important to keep an eye on nutrition labels. So don’t be afraid to check the nutrition labels. There’s a lot you can learn from reading them. Is Your Fish Oil Rancid?